When you avoid what you fear, your anxieties will worsen over time. Imagine you develop an irrational fear of tall bridges. You do not have to commute regularly over these types of bridges, but you do have to traverse them occasionally. You somehow do it each time. But, that pit in your stomach grows at the thought of spending time crossing it. Yes, accidents happen on bridges. For example, “The [Chesapeake] Bay Bridge has handled hundreds of millions of vehicles over 61 years — 28 million between July 1, 2011 and June 30, 2012 alone — and during that time, just two accidents have caused vehicles to go over the side.”¹ Now, I understand that the negative outcomes of our singing fears are entirely different from my, err, I mean ‘other people’s’, bridge-crossing fears. The avoidance of what we fear, however, is exactly the same. Human beings fear rejection. We will actively avoid situations in which we feel the potential to be rejected. Not singers, though. No, no, true divas pursue those opportunities. They understand they will hear “no” more often than “yes.” But, it’s that dogged persistence in the face of rejection that makes the “yes” so much sweeter. Your Day 20 challenge is to Wobble and Be Brave! Sometimes we are so afraid of criticism and rejection that we don’t perform at our best. When we keep our creativity under-wraps and succumb to nerves or anxiety, we give up our ability to add to the world. We become a black hole rather than a wellspring. Auditions, performances, even social situations are opportunities for us to put ourselves out there. When we have rejection experiences, we group those memories in a place throbbing with the constant “I told you that you’re not good enough” refrain. It is to our advantage to re-frame our thinking so that so-called rejection can become a positive lesson. Rather than plunging into that desolation zone, you can look for the value in each situation and gather feedback to impart on your next performance. Having a personal agenda beyond simply getting the gig, can be a really useful tool for finding each opportunity’s value. I really love this advice from Carol Kirkpatrick published on her website Aria Ready. If you haven’t read her book yet, I highly recommend it. It is not unusual, no matter how well you feel you performed, not to get picked if you are auditioning in your first round of professional auditions. The first season of auditions are generally more about you introducing yourself to the professional world of opera. If you are an unknown commodity you need to let those hiring get to know you and your talent. The performing community is a small one and word travels, so be at your best on all fronts. Until you get your foot on the first rung of that proverbial professional opera latter, continue getting all the experience you can and don’t be afraid to audition for the same people again next year. Often times they are interested in knowing what’s new on your résumé, how has your voice grown and also what your “rejection” level is. Did last’s years “no’s” make you quit or did it make you even more committed? First things first: stop avoiding your fear of rejection. If you are willing to act, you can practice getting over your fears. There is a sneaky self-preservation tactic singers employ when they do not pursue opportunities. Perhaps you are not as talented as you have believed for so long. If you don’t test those assumptions, you will never have to face rejection. It is flawed thinking to say the least; but, people do it all the time. Please don’t misunderstand me. If you do not get the gig from the audition that does not confirm your inability. I mean that you cannot have an actual singing business if you do not do any singing business. Take that audition, diva! Appearing foolish isn’t as life-threatening as people make it out to be. Taking healthy risks may feel uncomfortable but it isn’t a mortal threat. There’s a reason why they’re called “growing pains.” A painful or negative stimulation may cause you to act more swiftly to change the status quo. Don’t let the fleeting pain of feeling foolish make you feel like you cannot pursue your passion. Recall a time when you felt foolish or rejected in a singing experience. What did you do to address those insecurities for the next time? If you answered “nothing” or you have avoided any similar experiences, take a moment to brainstorm ways that you could become more confident in those areas. Think about the type of cleaning and housework you do before you have a guest over for the weekend. Why do we do it? Because we want our guests to be comfortable and not judge us for living in squalor. When you go out on the limb for more opportunities, you will work your patootie off to make sure that you are ready. Remember that quote about phone calls yesterday? “The more phone calls you make, the less emotional freight each individual call carries.” The more auditions you take (responsibly, of course), the more experience will teach you to re-frame your feelings on rejection. Remember that you are in control of how you feel. Only you. If you let fears of rejection take over your mind and actions, you will burnout in a hurry. You are able to create a personal agenda for each opportunity which allows for other value rather than just “getting the gig.” If and when rejection happens (’cause it does happen) give yourself time to wallow and feel all.the.feelings. When you are ready to move on, plan some time to do a postmortem review and that’s when you figure out how you can improve for the next go-round. Divas, what is the most important feedback you have ever gotten from an audition that didn’t go your way? That is such valuable information. I would love to know how you bounced back and came out swinging again. Please tell me your story in the comments below. No rejection there! 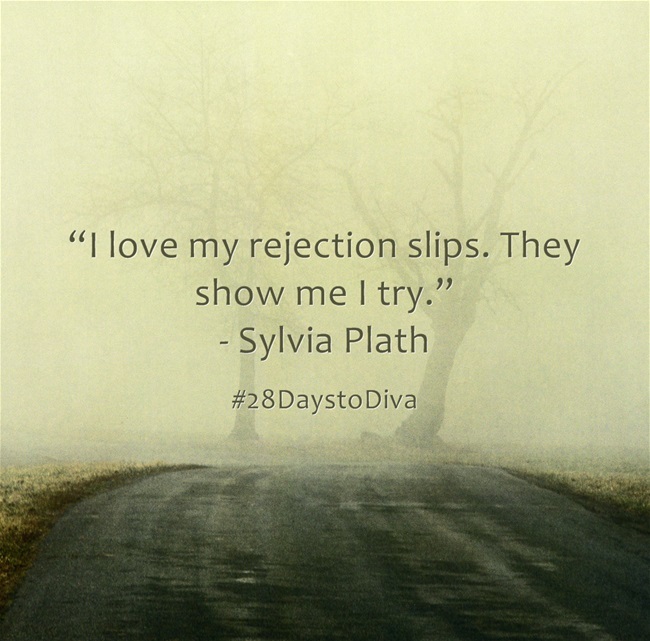 Or, find me in the twitterverse at @mezzoihnen using hashtag #28DaystoDiva. I find that these days most companies do not have time to give any particular feedback besides simple ‘yes’ or ‘no’. Usually you get more feedback from choir auditions but these people really enjoy to practice their supremacy and can often send quite nasty and caustic letters. The funniest feedback if one might call it like that I got was when the music director told me how the stage and dance directors really liked me, but I came ‘musically too prepared’. 😀 I didn’t get the job, but I really felt good about myself at that moment. Hahahaha – Ksenija, you have the best comments! You were “musically too prepared”?!?! That’s rich! You bring up a good point though that I didn’t clarify finely in the post. I don’t mean just verbal/written feedback from the audition panel. I also mean non-verbal cues that you noticed during the audition. You can also learn a lot from how you felt about certain parts of the audition – your feedback to yourself.